Every now and then we're lucky enough to premiere brand-new movie images, but it's rare that they go as well together or speak as much to the movie's themes as these two exclusive new images from Warrior. If you've caught one of the nonstop radio or TV ads you know Warrior is the story of two brothers, played by Joel Edgerton and Tom Hardy, who go head-to-head in a mixed martial arts competition that comes with a $5 million prize. But each of those brothers have their own separate stories as well-- Tommy (Hardy) has returned from his military tour obviously haunted, and Brendan (Edgerton) is struggling to pay the bills while raising two girls. 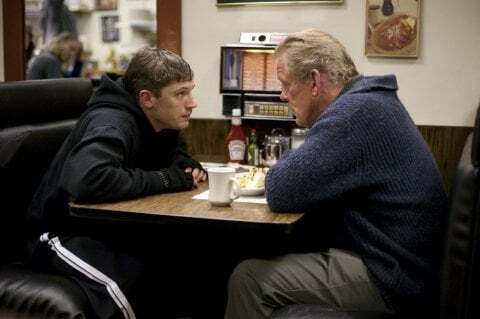 At the beginning of the film Tommy reunites with his estranged father (Nick Nolte) to ask for his help in training for a fight, and Brendan continues to debate over finances with his wife (Jennifer Morrison) while training secretly at a local gym. The two exclusive stills we're debuting, which you can see below, show two conversations over two tables-- Tommy at a diner talking his father into training him, and Tommy and his wife paying bills at their family table. The difference in the photos says everything about the contrast between Tommy and Brendan, and the family conflict that gets brought into the ring at the climax of Warrior. Check out the images below, and click on them for larger versions. Warrior doesn't open until next Friday, September 9, but critics have been buzzing about movie for months, and Nick Nolte has already been singled out as a future Best Supporting Actor nominee. If you want to know what all the excitement is about but can't wait until next Friday, Lionsgate is bringing sneak preview screenings of Warrior all over the country this Sunday; you can find all the details about those screenings here. For everything else you could possibly want to know about the movie, you can see these new images and much more in our Blend Film Database.